Andrew Symonds is believed to be contemplating retirement after being ordered home from the ICC World Twenty20 for an "alcohol-related incident" that has thrown Australia's tournament plans into disarray. Cricket Australia chief executive James Sutherland announced Symonds' contract was under review, but Cricinfo understands the allrounder may jump before he is pushed. The developments come after the Australian team's leadership group - consisting of Ricky Ponting, Michael Clarke, Tim Nielsen and Steve Bernard - recommended to Cricket Australia's board that Symonds be withdrawn from the World Twenty20 for drinking while watching the State of Origin rugby league match on Wednesday morning. While not a serious offence in isolation, Symonds' alcohol consumption contravened the conditions of a personal contract struck with Cricket Australia following a string of behavioural infractions. It is understood the terms of the contract have left Symonds feeling restricted and, according to one confidante, "no longer knowing how he can fit into the Australian team". 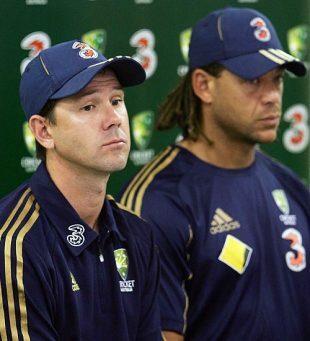 Ponting, speaking at a hastily convened press conference at The Oval, said Symonds had let down his employers, his teammates and himself. "There's no doubting Andrew's capabilities as a player, but there are other things happening around him that made the decision we've come to a relatively easy one," Ponting said. "This is not wholly and solely about Andrew Symonds. This is about the Australian cricket team. We've got some young guys who are just finding out what international cricket is all about. This is about the bigger picture and bringing on the next generation of Australian players." Though Symonds is not disputing the decision to withdraw him from the World Twenty20, he is apparently keen to tell his side of the story, and is expected to wait until he lands in Australia before speaking. Various reports have suggested Symonds' drinking became problematic during Australia's recent limited-overs tour of the UAE, and again after the Twenty20 warm-up match against New Zealand on Tuesday. But it was the "several beers" imbibed in the company of several team-mates while watching the State of Origin that is believed to have prompted Australia's leadership group to act, and push Symonds' career to the brink. Symonds attended a PCA dinner with the Australian Twenty20 squad at a Kensington hotel on Wednesday night, but was a notable absentee at Australia's training session at The Oval on Thursday. He was due to return to Australia on Thursday night, and a source close to the player told Cricinfo a retirement announcement could be imminent. "He is feeling like a square peg in a round hole," the source said. "It got to a stage where he had to make these commitments if he wanted to be selected for Australia. He knows he has put himself in this position, but there is no doubt he is struggling with it." Following a series of misdemeanours in the past 12 months, Symonds was on a final warning from Cricket Australia. Senior figures within CA pushed for his contract to be torn up after the "gone fishing" incident in Darwin last year, and Sutherland yesterday told reporters in Melbourne the allrounder's contract was "under review". "Tonight we have also advised him that we will take the [contract] offer off the table at this stage," Sutherland said. "In isolation, the breaches that I am talking about are not serious, but in the scheme of things, in the scheme of history, they are enough for it to be the final straw. I'm disappointed in Andrew, but I'm also disappointed for Andrew. I'm sad about it." Symonds has been involved in numerous off-field incidents in recent seasons, most notably a pre-match drinking session in Cardiff in 2005 which led to him being stood down from Australia's limited-overs team barely an hour before a match against Bangladesh. He also missed a team meeting to go fishing during a one-day series against Bangladesh in Darwin last year, which prompted team management to send him home and CA to arrange psychological counselling. An altercation with Clarke on last year's tour of the West Indies further frayed tensions between Symonds and the team management, and a drunken radio interview in January - in which he referred to the New Zealand wicketkeeper Brendon McCullum as "a piece of s..." - resulted in him receiving a fine and further disciplinary action. Symonds apologised, having admitted that alcohol was a problematic influence in his life, and he subsequently stated that he was "entering the final chapter of his career". Despite retaining his central contract only last month, Symonds was omitted from Australia's Ashes squad in favour of Andrew McDonald and Shane Watson. After 26 Tests and 198 ODIs dating back to November 1998, it is hard to see how his career can possibly recover from this latest episode.